For most people who have many apps installed on their iPhone, iPad or iPod touch the most annoying part of the overall app experience is downloading updates from the App Store for individual apps. Popular apps get updated more than often and it could be time consuming to open the App Store and manually hitting the update button every time and for each and every update. Thankfully iOS has a handy feature that allows users to make their iOS device update apps automatically without requiring any effort from their end. Once enabled the automatic downloads feature for apps detects which app’s update is available and downloads it without even notifying the user. This way all of your apps are up to date at any given time. Here’s how you can make iPhone or iPad download app updates automatically. Open Settings app and scroll down until you find the iTunes & App Store option. 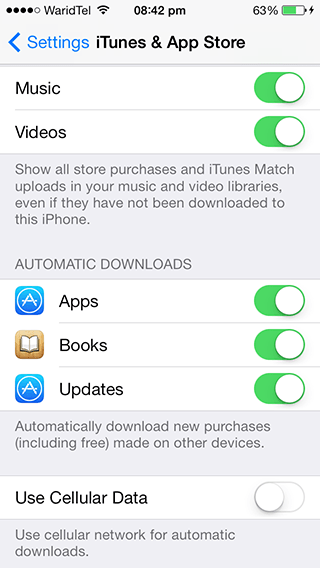 From iTunes & App Store section look for the ‘Updates’ option, which would be listed under ‘Automatic Downloads’. Enable this option. You can also update ‘Apps’ and ‘Books’ options, which would make your iPhone or iPad automatically download the apps or books you download on your other connected iOS devices. That’s it! Optionally you can enable the ‘Use Cellular Data’ option, which will allow iPhone or cellular iPad to download the enabled Automatic Downloads using the network’s data. If you have limited data allowance then it is recommended that you keep this option disabled. In that case the Automatic downloads will only occur when you are connected to a WiFi network.